Elegant, delicious, lasting. When you want to send a gift to be enjoyed in the moment and remembered long from now. The five gourmet macarons will melt on the tongue. The sweet mini orchid will grace a desk, table, dresser, anywhere that needs a bright touch. 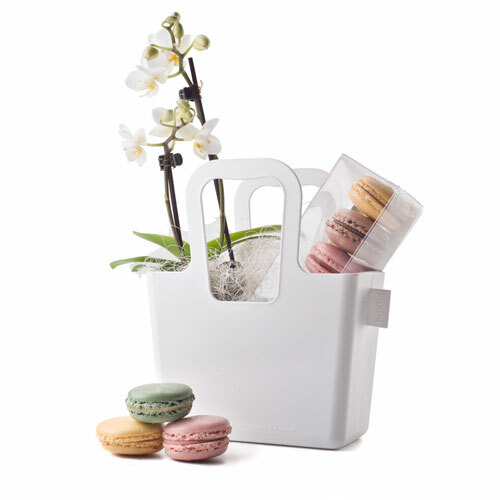 And the white Koziol Taschelini (18 cm tall) is a stylish container perfect for holding future treasures. Koizol Taschelini: Created by Italian designer Maria-Christina Hamel & Italian architect & designer Alessandro Mendini. Stylish, practical & durable.